Khat is a plant grown in parts of Africa and is chewed for mild stimulant effects. Last week the UK Advisory Council on the Misuse of Drugs issued a review of khat and made recommendations to the Home Secretary with regard regulation. Khat, the more common name for Catha edulis, is grown at high altitude in many African countries. The majority of the product is used locally, differentiating it from cocaine or heroin which are mainly grown for export. The shoots and leaves may be chewed, often for hours on end, to produce a mild stimulant effect. The effects, including increased euphoria, alertness and heart rate are similar to those experienced when taking amphetamine but less pronounced. Use can lead to rebound effects such as grumpiness and lethargy. 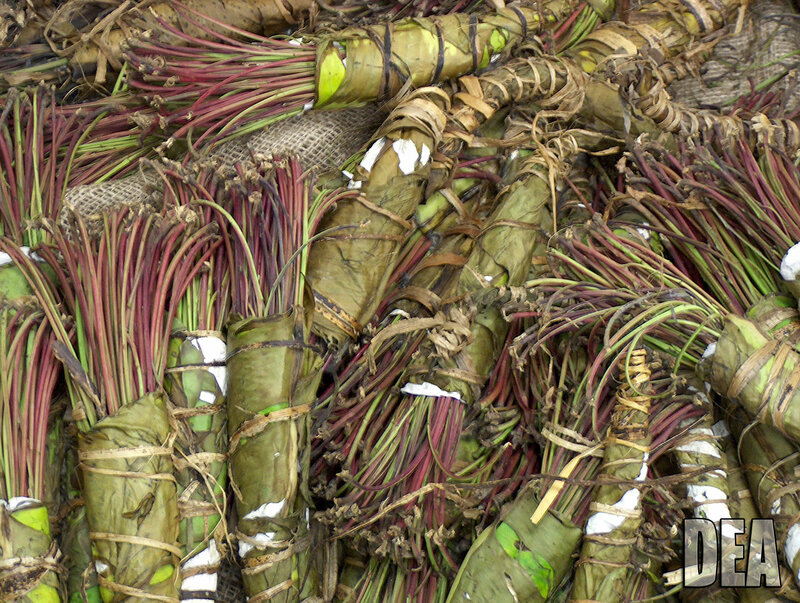 As it is not controlled by law, khat may be legally imported and sold in the UK. The Advisory Council on the Misuse of Drugs (ACMD) reported that over 2500 tonnes of the plant are imported into the UK each year with an approximate value of £13.8 million (raising £2.8 M in VAT income). Whilst this seems a large amount of money the Serious Organised Crime Agency estimate that the UK cannabis market alone is worth around £1 billion pounds per year. Khat is controlled by law in a number of other countries, including many European nations and the United States. The compounds released from the plant include the main active ingredients cathine and cathinone (shown below). These compounds are at their highest concentration in the plant material when very fresh with the dried leaves containing significantly less of the active ingredients. Whilst khat is not controlled in the UK both cathine and cathinone were classified as Class B in 2010. Possession of a Class B drug can lead to a maximum five year gaol sentence and unlimited fine. Cathine is an isomer of phenylpropanolamine, which is found in many cold remedies. Substituted cathinones (slight alterations to the chemical structure of cathinone) are frequently sold as drugs of abuse. One example of this is mephedrone which was in the news frequently and was also classified as a Class B drug in 2010. The use of khat has not been very common in European countries. Most of the drug’s use is found amongst immigrant populations, particularly Somali and Yemini in the UK. 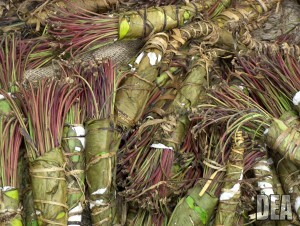 When used on a short term basis there is little evidence that khat is harmful. There are a few reports that serious liver damage may occur after prolonged use, which appears to be the most serious charge. There may be links with mental illness and khat use, with reports that post traumatic stress disorder in the war ravaged Somali community may be exacerbated, but more research is required in this area. If we were to design a system of drug regulation based on potential harm and dependence, such as suggested by David Nutt et al (The Lancet, 24 March 2007), then the classification would be based on a robust analysis of evidence. The ACMD report was over 90 pages long and was certainly extensive in its scope. As well as harm to the individual the report looked at the impact on society, stating that there was a lack of evidence of a link between khat use and social harm. They also found no link from khat import and distribution to organised crime. Here we have a very nice example of evidence based policy advise. There are some other recommendations, mainly around monitoring the societal and health impacts which are currently less well researched. Many in the scientific community have applauded this report, including Prof. Nutt calling it “robust, rational, rigorous’. Will the government heed this advice? A few years ago a senior politician (Baroness Warsi) promised that a Conservative government would control khat when in power. The Home Secretary has the next say on the matter. Watch this space! Please feel free to comment below and to sign up for further updates! Thanks for a sensible piece on this issue. Sadly, others, some in the mainstream media, are still trying to keep myths alive. There are those who persist in suggesting that khat is increasingly used by young people completely ignoring the much easier to use synthetics. Then there are others who cling to the khat=terrorism link and are trying to say that the ACMD’s failure to find a link shows how poor the ACMD’s work is. And, of course, some people still believe that the way to deal with family problems resulting from excessive use is to criminalise the user and completely break up the family. I thought the report was very thorough and well researched. I have seen khat use in some countries compared to alcohol use in Western countries. Some people abuse and suffer effects from it but a great many use it without a negative effect on their life. The media have made much of a possible clash between the ACMD and the Home Secretary. It would be sad to see politics again taking precedence over a well written and well though out recommendation. I have just had a read of your blog and there are some very good articles on there, thanks. Cathinone and cathine are Class C drugs not Class B.